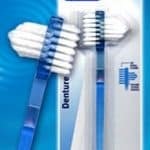 You have likely been informed by your denturist that you should not use regular toothpaste when cleaning your dentures. It may sound as if it has narrowed down your choices but that could not be further from the truth. 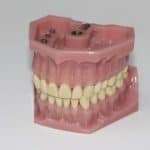 There are many denture cleanser and toothpaste options available, with each is formulated to be used specifically on dentures. This is because regular toothpaste is abrasive to the material false teeth are made from and may damage them, even if you use a proper denture brush. Promoted as being able to clean your dentures “in three minutes flat,” this product provides a deep cleaning faster than tablets or powders. The paste removes denture staining caused by coffee, tea, wine, and tobacco as well as any other kind of staining. 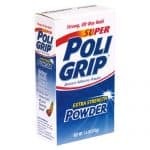 It even comes with an endorsement from the ADA Council on Scientific Affairs stating that this product is an effective cleaner of dental appliances. 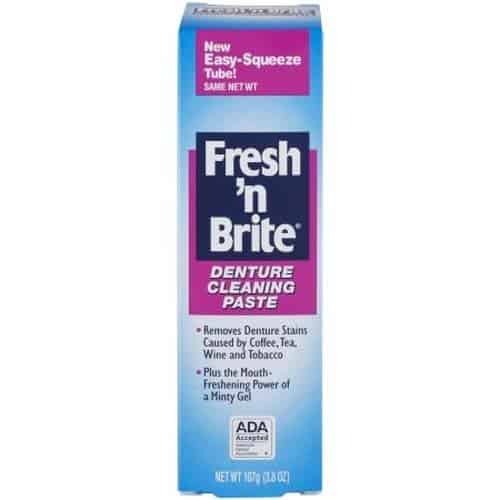 For more information on Fresh’n Brite Denture Cleaning Paste, click here. Promoted as the #1 Dentist Recommended Brand, Polident features a triple mint mouthwash formula that leaves your mouth minty fresh. The product is gentle on denture acrylic and is specially formulated to clean dentures quickly as well as kill germs that can develop into denture odor. The composition of ingredients used is such that they will clean and freshen dentures plus partials outside of the mouth. This particular packaging contains a total of six tubes of the denture cream. 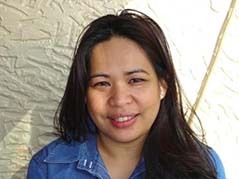 For more information on PolidentDentu-Creme, click here. Now available in a new size containing 240 tablets, this product is another popular brand of denture cleanser. Efferdent tablets have the bubbling action that fizzes away food particles as soon as one hits the water your dentures are sitting in. The tablet formula kills bacteria, fights odor and removes stains as well as dissolves the really tough ones caused by coffee, tea, wine or tobacco. This product is equally as effective on dentures as it is on partials and retainers. 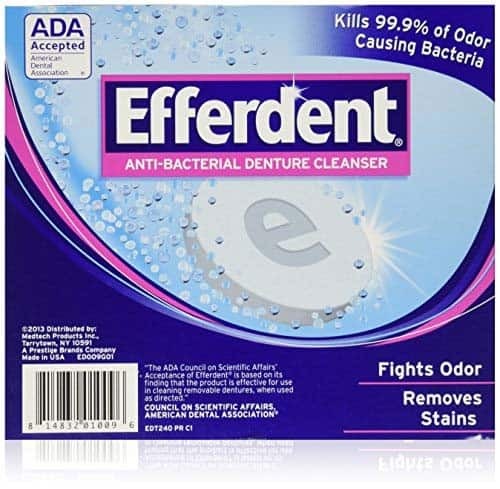 For more information on Efferdent Denture Cleansers, click here. Another fizzing tablet-style denture cleaner, Retainer Brite has a formula that will assist in the removal of plaque and tartar from dental appliances as well as kill germs and bacteria. In addition to cleaning and brightening retainers, this product will give them a minty fresh taste and scent. This package is promoted as enough tablets for three months of cleanings. 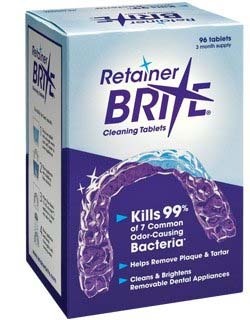 For more information on Retainer Brite Cleaning Tablets, click here. Packaged as a 2-pack of boxes containing 120 tablets each, this is an amazing product. 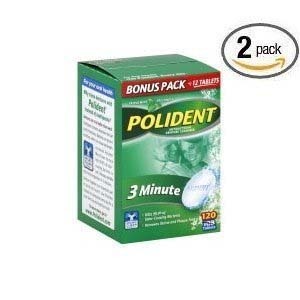 Polident is well known for dental hygiene and this is no exception. These tablets are formulated to clean dentures in 3-minutes with bubble action that removes stains and plaque in a flash. The ingredients are intended to eliminate 99.9% odor causing bacteria and the improved triple mint freshness adds to the final results. For more information on Polident Antibacterial Denture Cleansers, click here. This bath container is what you will need for cleaning and it is large enough to hold both uppers and lowers and comes complete with a no-spill strainer. The sturdy plastic construction ensures durability and ease of cleaning. The container is strong enough for use daily for cleaning or for overnight soaking. The lid snaps shut and they come in four different ccolors– white, light blue, dark blue or purple. For more information on Pepsodent Premium Denture Baths, click here. Pastes and tablets aside, you can use other methods for keeping your false teeth looking their best. When soaking them in a bath overnight you can use a few drops of dishwashing liquid in the water. Dishwashing liquid is not as harsh as other soaps and cleaners making it a great quick fix option. Ultrasonic cleaners are probably your best choice when it comes to keeping dentures clean. However, it is wise to combine the use of an ultrasonic unit with regular cleanings using denture toothpaste. 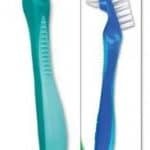 The toothpaste will remove visible debris and particles where ultrasonic treatments will eliminate microscopic bacteria. Click here for more information on the best ultrasonic denture cleaner options. Regardless of what option works best for you, the best way to keep your smile its brightest is to take proper care in cleaning your false teeth regularly. This is not only to address oral hygiene but by taking good care of your false teeth, they will last a long time.